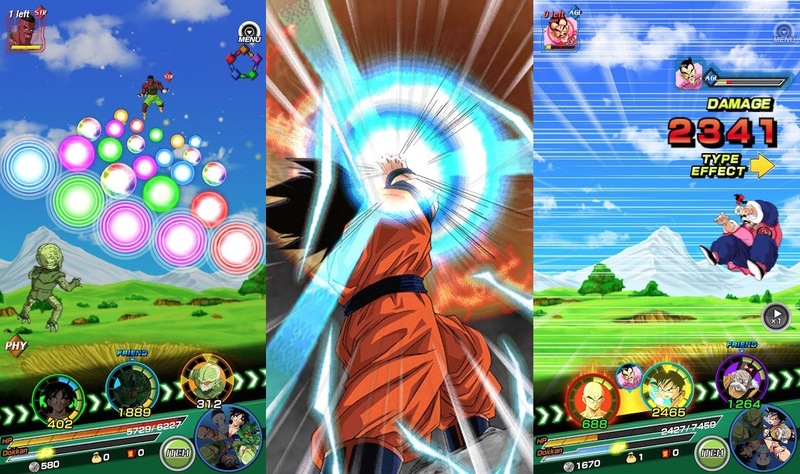 Dragon Ball Z: Dokkan Battle is a free to play adventure game made by Bandai Namco which in terms of game design isn’t the most innovative but nonetheless is still an interesting and entertaining game with its own storyline. The basic story as I understand is that you play as an unnamed warrior who helps Trunks to prevent issues caused by an expanding dimensional distortion. This premise seems fairly similar to Xenoverse, especially the whole part about distortions in time, and being able to fight the Z-Fighters as well as characters from all the important points in Dragon ball Z history. As you continue through the game, especially during the initial or introductory stages you are guided along by Trunks and King Kai who will offer you advice and take you through the plot of the story via comic-esque panels. The overall game is split into two parts, the first part is a board game where you pick from one of three randomly generated numbers, whichever number you pick out of the three will be the amount of moves you make, and what you land on will then impact the outcome, for example you could land on a free space tile in which case nothing will happen, a question mark tile which has a random effect (you will either suffer a random reduction to your health, the power of one of your characters will be temporarily boosted or you could earn a random item) You could also land on an item tile and finally you can land on an enemy title where you’ll have to do battle, while I’m talking about enemy tiles there are some that you can pass over without fighting and others that the game forces you to fight, the Boss of the level being an example of opponents you cannot avoid fighting. The board game aspect is usually fairly short, but there is variation to it firstly in terms of design, the levels of each are based around events on the show for example some are designed to emulate Namek or the wastelands of earth, there is also variation in difficulty, the first stage is normal, followed by hard and finally Z-hard. The increased difficulty opens up new paths on the board game but overall is largely similar, the only real change is the enemies are stronger. The second part of the game is basically colour matching, this is the battle aspect of the game wherein the screen fill up with a variety of different coloured ‘Ki’ balls which when clicked can be used to damage an opponent. The coloured balls are matched to an alignment, for example Blue is Agility and Green is Technique and each alignment is strong against one alignment and weak again another. So what you want to do is make sure that you keep an eye on what type of alignment your characters are so that you can match them up against what the opponent is weakest against, for example if your opponent is Yellow/Physical then you want to attack them with a Red/Strength character so that you’re attack does its full damage and you don’t want to attack them with a Blue/Agility character because they are weak against them and so your attack would be at least partially blocked. It might seem a little confusing but you’ll pick it up quickly and there is a colour wheel in the corner during every battle which tells you who’s strong and weak against what so you can play strategically. The amount of same coloured ‘Ki’ balls you tap affects your power, for example if you only tap just one then its won’t fill up your ‘Ki’ wheel but if you tap four/five then their is a good chance you’ll fill it up and get a super attack. Here’s a tip Save your Dragon Stones, these get rarer as you play, although occasionally as an apology for a glitch or as a reward the game will through them at you, but you can spend them in various ways, for example to fill your stamina bar, which is a waste or to revive after dying in battle, I’d advise not doing that as its a waste, Dragon Stones are much better suited to either summon new characters and/or buying spaces in your inventory for new characters. Finally unlocking characters, you start off with a character and you can earn more by playing through the story missions but they usually tend to be low level and even with upgrading to their maximum can’t stand up to stronger opponents as you progress. However as well as that you can click the summoning menu and spend either friend points or Dragon Stones to buy top level characters then you can start building up a proper team. Teams are important, you can upgrade your characters first through training till they’re at their maximum and then Awaken them to read a new level of strength. When upgrading your team you need to be careful, you have something called a Team cost, and each character costs a certain amount to be added to your team, stronger characters cost more and if you spend too much then you can’t add anyone else to your team. Any free spaces are filled up with weak disposable characters called Saibamen. The Team cost grows as you level up meaning you have more to spend and can add stronger characters to your team. So those are all the basic elements of the game, it can get a bit tedious but overall it’s a fun and entertaining game where you can build up your ideal team, and collect hundreds of different variations of your favourite character, For example I currently have a variation of each version of Goku from his base for right up to Super Saiyan God. Basically if you like a game that offers a rewards for logging on, offers you all the nostalgia of playing as your favourite characters from one of the biggest anime’s in history and on its own merits in at least decent to play then Dragon Ball Z: Dokkan Battle is the game for you. I think I’ll give it a 6/10. Click below for links to get the game on your preferred device today.